Khanom is one of Thailand’s last pristine tourist locations. A paradise where swaying coconut palms, lush green landscape, limestone mountains and virtually untouched beaches still remain in their natural beauty. Long white sand beach. The fine sand starts right underneath the coconut trees and continues for 20-30 meters to the clear green water. There are no corals, no rocks and water is clear – all needed attributes for a perfect swimming place. Except the three or four weeks in November when the NE monsoon brings strong winds and big waves, the weather is gorgeous – sunny, with a bit of breeze, just enough so you can breathe even on the hottest days. Most of the Thais living in Khanom are farmers of fishermen. Either they go out on the sea for some fresh fish or squid, or they take care of their coconut of rubber plantations. Just a few have converted to tourism and opened small cozy resorts on the beach. Very quiet people, helpful and unspoiled by the mass tourism and consumerism. The very few resident foreigners are mostly English teachers them as well very decent and kind people. The icon attraction for Khanom is the “Pink Dolphins” colony which patrols the cost every day. North-East to the village there is one national park, to the west lays another one. There are two waterfalls, and a cave within a few minutes drive from the village. If you venture 20 km to the south or north, you will discover many other small and lovely beaches. The mountains which guard the beach at both ends are covered in pristine jungle, full of colorful birds. 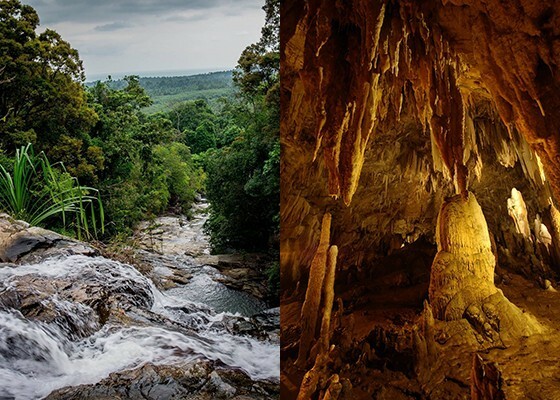 Not to mention all the other natural or man-made wonders in Nakhon Si Thammarat and Surat Thani provinces – all within one-two hours drive.